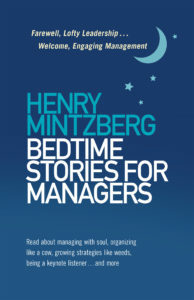 When the opportunity was offered to review Bedtime Stories for Managers, I eagerly accepted. I liked the idea of short stories with corresponding teachings about leadership. I loved the concepts of “managing with soul,” “expecting extraordinary ideas of ordinary people,” and “engaging management;‘ all descriptions used in the solicitation letter. My reactions included the following: What? That’s not leadership at all! Who thinks that way? Who tries to lead that way? Oh, that’s an interesting concept. I had not considered it that way before! Did I read that right? Sigh. I think Mr. Mintzberg is attempting to convey that the best managers are also leaders and the best leaders are also managers. I completely agree. I also believe he is trying to say that whatever leadership or management role you have, you must understand the work, challenges and opportunities of the people you work with. Again, agreed. And I also disagree with many of his other opinions about management and leadership. And that was the challenge for me with this book. There is a biting sarcasm to many of his opinions that did anything but inspire me. He is critical of many modern leadership ideas and practices, primarily because he doesn’t seem to really understand them. At 79 years he clearly rose up through a different age of work and work style. Perhaps that experience is the root of his opinion and panic about modern leaders, managers and the modern workplace. The final chapter for me was not the final chapter of the book. It was the first reading in section five “Managing in Context”. Mr. Mintzberg discusses the concept of succession and how private businesses are most often passed on from father to son, not because the son is a good business person, but because the son is the son. I read on, waiting for a promised return to the idea of fathers bypassing their daughters. I reread it several times. What if the daughter had a more astute business mind? Was more goal-oriented? Had a head for numbers and a heart for team? What if the son was not interested in taking on the family business? Perhaps he forged his own path, following his own passion. As the Mom of a smart and successful female entrepreneur, that was the end of my reading, admittedly about 45 pages before the end of the book. From a style perspective, many people might enjoy this book. From a substance perspective, it really depends on how you view leadership and management in today’s business environment. At the very least, it would spark good debate, I’m sure. That being said, for the leaders I coach and the leader managers I have worked closely with, this book would not be a recommended read. I stand firmly in the principles of servant leadership rooted in love. Much of this book is counter to that style of work. Note: A copy of this book was provided at no cost to me. In no other way was the opinion expressed above influenced.